I have something really great to share with you guys! Do you know that 313@Somerset had launched their very own mobile app Tring 313! Tring 313 is a location based mobile application (app) complete with a payment gateway; shoppers will receive relevant promotions where and when they want it with the ability to shop round the clock as the app will tailor alerts to their personal profiles and preferences. Tring 313 is designed to send push notifications to shoppers within a 500 metres proximity of the mall, informing of current promotions and event highlights. Shoppers can also choose to “follow” selected brands in 313@somerset which will allow them to receive notifications of the brands’ promotions even when they are outside the defined proximity. The technology is advanced and provides a personal approach to shoppers’ preferences as the App identifies relevant promotions, offers and events just for them based on previous purchase patterns and profile information. The ease of in-app navigation, coupled with its capability to draw on individual shoppers’ trends and historical data will redefine the way 313 will connect with its shoppers. •High street fashion brand Forever 21 is featuring exclusive offers til 31 Dec 2012! 10% off all shoes and a Lip Gloss Bundle Buy going for 3 at $7 (U.P. $3 each). •HMV allows music lovers to save $3 with every $25 spent from 29 Nov – 31 Dec. Alongside this, free exclusive HMV mobile phone screen cleaners are also up for grabs without any minimum spend! 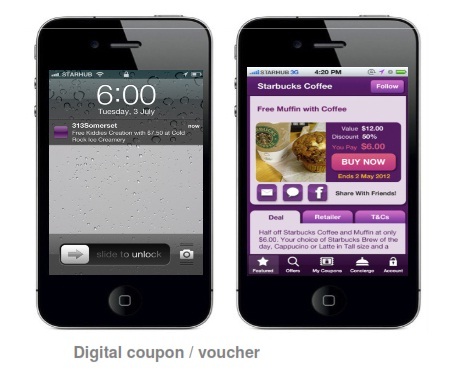 Shoppers need only present the coupon for redemption. •Wine and dine at Malones Irish Restaurant & Bar – from 29 Nov – 31 Dec, shoppers will be able to enjoy any 2 full pint Archipelago beers at $18++ (U.P. $28). You can now download Tring 313 at Apple App Store! For more information, shoppers can enquire or call the Concierge Desk at 6496 9313 or log on to the 313@somerset Facebook page www.facebook.com/313somerset.